This month’s book club selection is The Life She Was Given by Ellen Marie Wiseman. The only other book I’ve read by Ms. Wiseman is The Plum Tree, though she has two others: What She Left Behind and Coal River. Her books feature female protagonists placed in heart-wrenching circumstances who somehow learn to survive and grow. 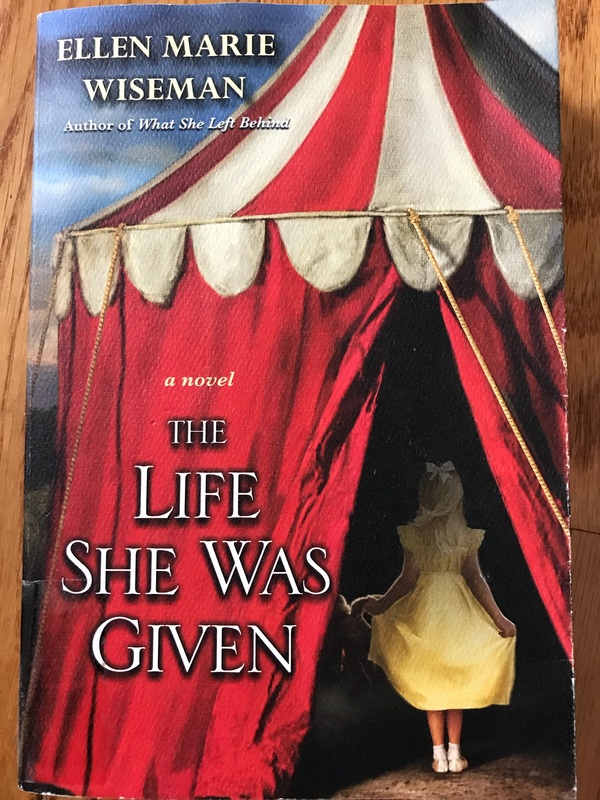 The Life She Was Given is about two people: Lilly Blackwood, a young Albino girl whose mother sells her to the circus during the Great Depression, and Julia Blackwood, a young woman who has run away from home in the mid-1950s to escape her controlling and unkind mother. For anyone who hasn’t read the book, I won’t put out any spoilers, but you may want to avoid reading the questions below until you’ve had a chance to read it. I have mixed feelings about the book. I think Ellen Marie Wiseman is an extremely skilled and gifted writer and she has a way with words that I can almost assure you will bring tears to your eyes (if not a gushing flood of emotion). That being said, this story pushed me a little too far out of my comfort zone. I actually skipped one whole chapter because I knew what was going to happen and I just couldn’t bring myself to read it. I have to say I’ve never done that before. For those of you who read it, what did you think? What were your overall impressions? And if you read the book, can you guess the chapter I skipped? When Lilly left Blackwood Manor after ten years of never setting foot outside the attic, were you surprised by how quickly she acclimated to life on the outside? Did you expect her to have more developmental problems given the isolation of her first ten years? What is the author trying to say, if anything, about religion in The Life She Was Given? Why do you think Momma and Father were unkind to Julia, when their stated intention was to give her the life her mother had never had? Do you think Momma loved Lilly, or was her attitude toward her daughter based on something else? Do you think Lilly could have survived on her own if she had escaped from Momma on the way to the circus? What are your feelings about Lilly’s father? The parallels between Lilly’s life and that of the elephants and other animals are many and obvious. How did you feel when Jojo was taken from Pepper? What do you think of Claude? Do you think he did the right thing by keeping to himself during the time after Lilly disappeared? Do you think he was right not to share his knowledge with Julia? Do you think the title, The Life She Was Given, specifically refers to Lilly? Did you think it could refer to Julia, too? Have you ever been to the circus? What is your opinion of circuses? Next month’s book is The Alice Network by Kate Quinn. It’s a story about a college student looking for a cousin in France after WWII who is joined by a former spy from WWI. I’m excited to read this one! This entry was posted in Last Tuesday Book Club and tagged animal cruelty, circus, Ellen Marie Wiseman, literary fiction. I appreciate your honest review, Amy. I think this is why I don’t join book clubs. What one reader loves to read may be quite uncomfortable for another reader. And one reader may love non-fiction, and another bored to tears unless it’s a fictional page-turner. I find that I’m a reader who likes to be stretched perhaps in a book, but not scared (too many nightmares) or horrified with that gut-twisted feeling. Just not my thing. So many well-written books out there, and it sounds like Ellen Marie Wiseman is a gifted author. Which is why we readers are so lucky to have good choices of reading material, and we writers are lucky to have readers who choose to read our ‘brand’ if it fits their readying style. Yes, this one was a stretch for me. I suppose that’s why I’m more of a genre fiction person than a literary fiction person. When bad things happen in genre fiction, the problem is typically solved by the end of the book, whereas in literary fiction there’s more of a hopeless feeling in the end (in my humble opinion). There are enough real problems in the world. Thanks for stopping by! I hope you’ll let me know what you think of it when you read it. This book generated lots of discussion–made for a great book club selection. Smart, Claire! As much as I didn’t want to include spoilers in the questions, it’s almost unavoidable. I’m glad you’re going to read the book–let me know what you think! And thanks so much for stopping by. Sounds like a difficult read! But that cover is really pretty. I think I’m going to add this one to my wish list. Definitely a difficult read! But I’m glad I read it. Thanks for coming by! Ellen Marie Wiseman is highly skilled, and if you like emotional upheaval when you read, I highly recommend her books. Thanks for visiting! Diane, So, he maybe died and maybe didn’t. I think I misread your question initially… I thought you were talking about Lily’s husband! Whoops! Either way, I don’t believe there were specifics as to whether either of them were actually dead! Hmmm ! Speculation! LOL. Great book, great interaction. You’re right–this was a great discussion! I wish we could have interaction like this every month. Maybe we’ll try to get some more people for The Alice Network and see how it goes. Thanks again to you and Diane for participating! It was fun! I’m trying to get someone at work on board who likes to read as well. Then they’ll be four 🙂 In Anycase…Sharon 🙂 I think Cole could still be alive! Check out the book, The Life She Was Given, by Ellen Marie Wiseman, as featured in The Last Tuesday Book Club post from the Reade and Write blog. I know I won’t be as detailed as you two were answering these questions. I’ll do my best to convey how I felt about this story. 1) When Lilly left Blackwood Manor after ten years of never setting foot outside the attic, were you surprised by how quickly she acclimated to life on the outside? I was extremely surprised how well she seemed to adapt to the outside, however, I felt she did learn very much through the books she read. She was also very smart and intuitive, I’m sure that helped her a great deal. 2) Did you expect her to have more developmental problems given the isolation of her first ten years? No, again because she was very intelligent. She also had a caring mother figure, Glory, who took her under her wing and helped her. 3) What is the author trying to say, if anything, about religion in The Life She Was Given? The religious message in this story was one of control, not a good picture. 4) Why do you think Momma and Father were unkind to Julia, when their stated intention was to give her the life her mother had never had? I felt that her mother and father became very cold, cruel, uncaring people when they were given a child that was different and they didn’t know how to deal with her. 5) Do you think Momma loved Lilly, or was her attitude toward her daughter based on something else? No, I think Lilly’s mother detached herself very early on from any feelings she could ever have for Lilly. 6) Do you think Lilly could have survived on her own if she had escaped from Momma on the way to the circus? Yes, I think we all agree on this one, she would’ve survived but would not have had a good life. 7) What are your feelings about Lilly’s father? He was a week and spineless!! 8) The parallels between Lilly’s life and that of the elephants and other animals are many and obvious. How did you feel when Jojo was taken from Pepper? It destroyed me inside. Anytime people and/or animals are torn away from who the love it’s so heart wrenching. I believe it’s worse with animals because they don’t understand what’s going on and you can’t explain it to them. 9) What do you think of Claude? Do you think he did the right thing by keeping to himself during the time after Lilly disappeared? I don’t think, at the time, he knew the whole story. Also, again, during those times, things were very different and it was normal to “look the other way”. 10) Do you think he was right not to share his knowledge with Julia? In the beginning, yes but I feel he took it a bit too far. He should’ve come around sooner. 11) Do you think the title, The Life She Was Given, specifically refers to Lilly? Did you think it could refer to Julia, too? I feel like it refers to both of them and is an excellent title. 12) Have you ever been to the circus? Yes but I really don’t remember it too well. 13) What is your opinion of circuses? The fact that I don’t remember it should say something about my opinion. **So at first when I heard that you skipped a chapter, I immediately thought of the chapter when they took JoJo away. Then when I was reminded of the other chapter….well, I wish I didn’t read it either, I’ve obviously tried to block it from my memory!!!! There are two more things that are bugging me. 1) Did Phoebe/Julia’s father really die? 2) Why did they change Phoebe’s name to Julia? Maybe he didn’t die and they were trying to hide her? I think I need to head to bed now. I enjoyed the book, it was a page turner, except for the one part we would like to forget. I never even gave it any thought at the time, but doesn’t Viktor say something about killing him? And that’s the reason Viktor wants revenge? I already returned the book to the library, so I don’t have it with me to check. I can’t check it either, Amy, I did this one on audible. No way to do a search. In addition to “Momma’s” lack of feelings for her daughter, she left a cat up in the attic to die! She didn’t even just release it outside. Julia found it’s skeleton in the closet of the attic. What makes is worse is there are people like that in this world. It makes me so angry and I’ll never understand. We didn’t even get to discuss the cruelty of the men in charge at the circus. They were horrible! And as for Momma letting the cat die, there was no reason for it. The cat had nothing to do with her deal with the devil, so I think by the time she sold Lilly, she had lost the ability to love. It’s sick!! I’m so glad you found us and were able to participate! Thanks for coming. I agree that it was shocking how well Lilly was able to adapt after being locked up for ten years. I wonder, though, whether books could have told her everything. And to know everything she did, she would have had to be an extremely gifted reader. Her father didn’t seem to spend too much time with her, and I’m assuming he didn’t spend all the time necessary to teach her to read. I believe she was largely self-taught. You make a great point about Glory, and I didn’t even think about how important a role she played as a mother figure when I answered the questions. Without Glory, who was a much better mother to Lilly than her real mother, Lilly might never have survived as well as she did. You make another excellent point when you say that Lilly’s mother “detached herself” from Lilly very early on. The way you write it makes it seem like a conscious decision on Momma’s part, and that makes her even more hateful. I was thinking that detachment would naturally happen under those circumstances, but you’re absolutely right–the mother detached herself. She’s the one at fault. I do think that Lilly’s father died in the drunk driving accident when she was younger, since she seems fully aware of it and blames herself for it. If she had a question about his death, I would be more suspicious, but she seems to accept it as fact. I think Phoebe’s name was changed to Julia to facilitate a complete break from her real mother. Maybe Momma and Father didn’t want her to grow up with her name as a constant reminder of what they had done. Your questions bring up one more question in my mind: what really happened to Cole? I believe that he died, but did he really die in an accident? We have only Momma’s word to go by. Do you think it’s possible he killed himself out of grief, or would his love for Phoebe have kept him alive? Thanks again for joining the discussion!! There was definitely a lot of cruelty toward people and animals… and my guess, there probably still is. I am sure training those animals isn’t easy. I don’t think I will ever go to a circus again!! Ahhhh, Mixed Emotions is a perfect way to describe Ellen Marie Wiseman! I have now read all of her books. I found “The Plum Tree” to be the hardest to read. I think Ellen is indeed a talented and gifted writer. Of course, her books are fiction, but could very well be based on true stories. I think that is one of the reasons she leaves us with mixed emotions… why did these (or similar) things happen in the first place. And why didn’t somebody, somewhere stop it? Food for thought, for sure! When Lilly left Blackwood Manor after ten years of never setting foot outside the attic, were you surprised by how quickly she acclimated to life on the outside? Absolutely, that was a bit hard to believe…. although, in retrospect, if you can live in an attic for ten years without going crazy, then adjusting to the world quickly is possible. And at the circus, she was pretty much locked up as well. Did you expect her to have more developmental problems given the isolation of her first ten years? Ahh, religion… well maybe Ellen can join us and tell us that answer… 😀 I personally think that mama used religion as an excuse for her behavior. You were born this way, so you must be a sinner…. and only God can forgive you, so you must spend all of your time reading the Bible. So often, as humans, we see God as a punisher rather than a savior!, asking ourselves what we did wrong, and why do these things happen to me? I think we are all a little guilty of this at sometime in our lives. I would say, Guilt! They never should have taken Julia from Lily in the first place. As for mom, she was just selfish and self righteous! God forbid, anyone find out the truth! And Dad, he was a coward! Momma loved herself and nobody else! She may have, but her life probably would have been worse… likely prostitution. One word for dad…. COWARD! Very sad… human or animal, nobody should be torn apart! I understand Claude’s decision to keep quiet initially… he needed his job and unfortunately, he was caught in the middle of a very bad situation. Not sure I could have kept quiet, but unless you live the situation, it’s hard to pass judgement. As far as Julis, I also understand him keeping quiet. However, once he saw that she was determined to find out, then sharing the truth was the right thing to do. I have only been to the circus a couple of times… never to a freak show (as they call them). And no desire to see that. And I am not a big fan of trained animals since I have read on more than one occasion, how they are trained. Definitely cruelty is involved. I really enjoyed reading this book… and after reading it, I realized that it was going to be a little out of your comfort zone…. but sometimes we need to step out there and experience those crazy emotions! I am looking forward to the next book and I hope we get some more followers. p.s. I pretty much guessed that the chapter you skipped was the one where Pepper was killed! It was very hard reading! When Lilly left Blackwood Manor, I expected her to have more problems, both mentally and developmentally. She definitely had problems, but somehow I think they would have been even worse after being locked up for ten years. Based on what I’ve read about babies who are denied physical contact and love from the time they’re very young, they develop problems that are really insurmountable. Lilly seemed to recover more quickly than I thought she would from her ordeal. I’m still trying to figure out what the book says about religion, but it’s definitely focused on punishment rather than love. Momma’s religion is certainly toxic, though thankfully Lilly doesn’t seem to have absorbed too much of it. I think Momma was unkind to Julia because she didn’t know, or maybe remember, how to be kind. I think it would be possible for someone who turns cruel to maintain that as a way of life, even if that person wasn’t cruel at first. That picture of Momma that Julia found in her father’s den showed a woman who was happy and smiling and kind-looking, but perverted religious beliefs and years of cruelty changed her forever. As for Father, I think he was a spineless coward and wasn’t capable of acting like a father toward Julia. I think Momma could have loved Lilly, if it hadn’t been for the promise she made to God in exchange for having a baby. She loved her husband at one time, so I assume she would have been capable of loving a baby, too. But there’s that religion again, making Momma into a monster who stayed forever. I’m not sure Lilly could have survived on her own outside of Blackwood Manor. You’re probably right that she would have had to turn to prostitution, or she would have ended up in an institution where she likely wouldn’t have been treated much better. But were attitudes back then really that shallow? Would someone with Albinism really be put into an asylum just because they lacked skin pigmentation? I don’t know the answer to that. Ah, the father. I hate him. I cried like a baby when Jojo was taken from her mother. It’s funny- I didn’t cry when Lilly was sold to the circus, though I was finding it hard to take a deep breath. But the elephant–I just couldn’t stand it. I’m not sure why that is. Maybe because Lilly would reach an age where someone could explain to her what happened, whereas the elephant would always wonder. I can’t even stand thinking about it now. Claude is one character whom I could barely tolerate. I agree that he may have kept out of it when Lilly was taken away and allegedly died in order to keep his job, but as the years passed and he realized what was going on, it was never too late to call the police or tell someone what was going on. And when Julia came to Blackwood Manor, I don’t think there was any reason for Claude to be so nasty to her from the get-go. He may not have wanted to tell her what he knew, but he didn’t need to make her feel so unwelcome in her own home, either. I think the title should refer to both Lilly and Julia if it didn’t already. Both women had no say in the way in which they were brought up and in the ways they were treated by their parents/grandparents. I am glad I read this book, despite all the strong emotions it stirred up in me. As the author says in the back of the book, Pepper’s death was based on a true story, and it wouldn’t surprise me to learn that Lilly’s story was based on true events, too. The things people do for money can be horrific whether we’re in the Great Depression or not, and it’s important to be reminded that there are people out there who are living lives I can only have nightmares about. I knew you were going to suggest that!! 🙂 I may read The Life She Left Behind, but I need a little break before I get into that one!